We’ve just released Wild Apricot version 5.3! Like all of our upgrades, this one was delivered automatically to all paid, free and trial accounts. We’ve added two new icons beside the Support icon in the administrative back-end of your Wild Apricot account: Knowledge and Community. 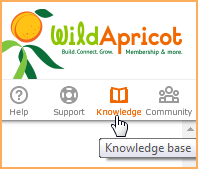 Clicking the Knowledge option will take you to Wild Apricot's Knowledge Hub, where you can find information and resources for small organizations like yours on topics such as membership, events, leadership and much more. Expert Webinar Series – offering expert advice through our monthly webinars (you can register for live webinars and check-out post-webinar videos and presentations). 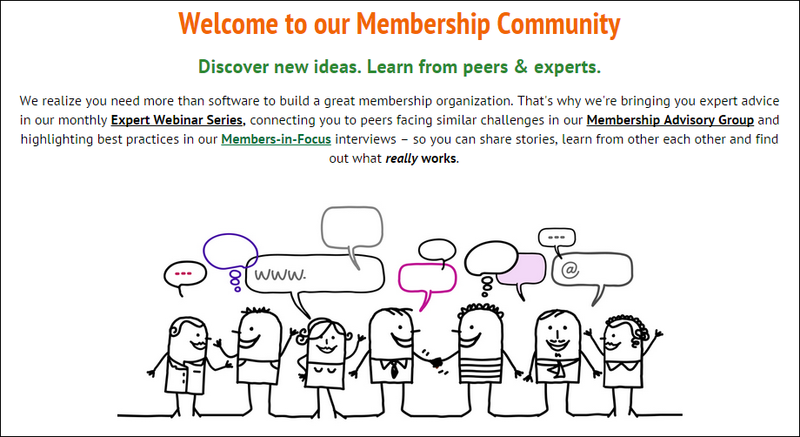 Membership Advisory Group – monthly group calls connect you with peers in similar situations, facing similar challenges. It's a place to share ideas, work on strategies, contribute best practices or just listen in. Members-in-Focus – 1-on-1 interviews with stand-out members of our Advisory Group that provide an inside look at how membership organizations got started, grew their membership, overcame challenges and devised strategies for success. In addition to the new icons, we’ll be setting flags that notify you when there are new posts of note within the help site, or new articles in the Knowledge Hub or the Membership Community, or if you have an unread support reply. A New flag will appear within the corresponding icon. In addition, if you hover over the Help icon while the New flag is being displayed, you can jump to the highlighted help topic. 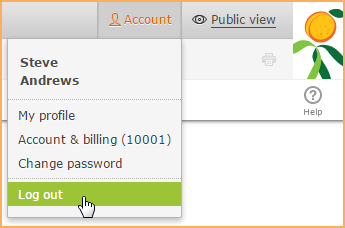 In adding the new icons and flags, we’ve moved the location of the Log out option in admin view. This has been moved to the Account menu, which itself has moved from beside the Support icon to beside the Public view option. 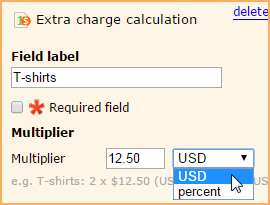 A new field type is available for membership fields and event fields: extra charge calculation. This new feature allows you to specify a unit cost for multiple orders, or apply a percentage to charge dynamic fees based on some factor. For example, you might want to provide an option to purchase any number of t-shirts, or charge a variable membership or event fee based on organization size or income. For full details, see: extra charge calculation field in our online help. With version 5.3, we’ve launched another new fully responsive, mobile-friendly website theme set – Skyline. Though designed with real estate organizations in mind, Skyline themes can be used by any type of organization, particularly if you want to take advantage of its responsiveness and its theme-specific functionality. The process of duplicating an event has been split off from that of creating an event, making it faster and easier to duplicate existing events. You can now duplicate an event within the event list, simply by clicking the Duplicate button beside the event. Previously, when choosing the recipients for event announcements, you could select all contacts, or any combination of members, donors, registrants from past events, or all other contacts not already included in this list. Now, you can also choose specific membership levels, member groups, and saved searches. Since your contacts cannot register for admin-only events, scheduled event emails are now automatically disabled for admin-only events. You can, however, send the email manually by clicking the Send now button for that announcement. You will be warned that your email recipients will be unable to register for the event. Now, when pasting formatted text, the content editor will try to preserve as much of the formatting as possible, but will discard any incompatible formatting – formatting that it cannot reproduce itself. For example, some table formatting and text alignment options available in Microsoft Word may not be available in Wild Apricot's content editor, and will be discarded when pasting. For full details, please refer to “pasting content from other sources” in our online help. With version 5.3, we have improved the speed of member directory gadgets and featured member gadgets by switching to ElasticSearch, an open-source search server. We will be gradually implementing the search switchover within Wild Apricot sites, beginning with free accounts. In this way, we can gauge the impact and address any issues before rolling out the change to other accounts. For a full list of resolved issues – see “Bug fixes” in our online help. For all of the details on what's new, check out the 5.3 release notes in our online help. Not using Wild Apricot yet? What are you waiting for?!? Sign up for an instant free trial today. Thanks Shivan! When are we going to get event promo codes? Tiger, if by event promo codes, you mean special registration codes for discounted event registration fees, then we already have them. See https://help.wildapricot.com/display/DOC/Event+coupon+codes . Let me know if this isn't what you meant. So the ability to attach objects (files) is not provided with this release? Update older themes to responsive behavior is in our plans. Currently we're working on Treehouse, then we will be working on Fiesta and Simple set.